Does your OEM need a tune-up? Outsource Corporate Partners, LLC (OCP) field representatives devote time and energy mentoring OEM clients to better serve their customers. The specialized skill training they provide facilitates our clients in applying all the tools we make available in their toolbox to deliver exceptional service. One such tool is a program designed by OCP, “Repower”, which has generated new satisfied and loyal customers. Budgets for fleet management and replacement have been on the decline for some time, especially among financially strapped municipalities, counties, and states. Replacing older vehicles with today’s high priced new vehicles usually isn’t an option. Add expensive technical training, tools, and equipment for new vehicles to their cost, and new vehicles are usually a no-go. And there is still the potential need for new bodies, booms, hydraulics, maintenance storage compartments, etc. to be considered. The fleet managers may be tempted to shop for a new OEM vendor, but then discover that increased training, tooling and inventory costs erode any expected savings that a new OEM would normally provide. That’s where OCP’s “Repower” program has solved this dilemma with the use of newly re- manufactured OEM engines and transmissions. Repowering older fleet vehicles give them a new life with the latest upgrades and factory improvements. Plus, an extended factory warranty (covered nationwide by the OEM dealer network) provides their technicians with continued work on products that they are familiar with at no additional training, tooling or inventory costs. Another repowering perk that benefits the dealer when selling power-train components is the business of maintaining repowered vehicles with the potential sale/service of drive-train components such as tires, batteries, lights, hydraulics, interior or exterior wear or damage, specialty body repairs or refurbishment, etc. 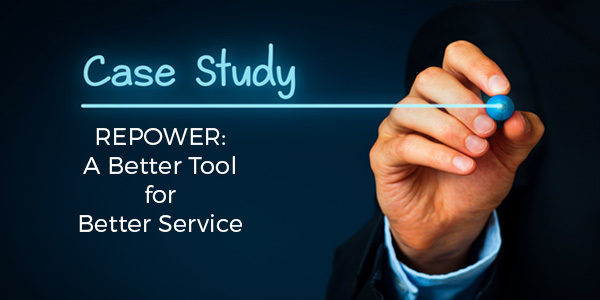 In another instance, one of our dealers, using the OCP “Repower” program, breathed new life into a local tow truck company to the tune of $105,000 in the initial savings alone. The dealer repowered and refurbished one of their tow trucks for $35,000, as opposed to the $140,000 a newly outfitted unit would have cost. Along with the substantial profit the tow truck company secured by repowering, the OEM provided a 2-yr warranty on the diesel engine, a 3-yr warranty on the transmission along with no additional training or inventory costs. Lastly, the owner of the tow truck company had the added bonus of savings available for re-directing back into the business as needed or to “Repower” other vehicles. Now that’s how long-term, loyal customers are made. OCP’s “Repower” program has been successful for other dealers who are using the program with retail vehicle owners or to first responder departments whose officers prefer the fit and feel of their older vehicles over the latest offerings. Does your OEM need a tune-up? OCP has the tools to keep your business up & running more cost-effective and efficient. Contact us to learn more about Outsource Corporate Partners and our specialized solutions for your OEM Manufacturer/Dealer.